Two men have been jailed for life for murdering a music fan after a row over the lyrics of a rap song. 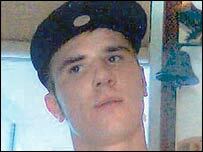 Richard Holmes, 21, was shot dead by associates of rapper Dwayne Mahorn, known as MC Durrty Goodz, in Chingford, east London, on 4 November 2005. 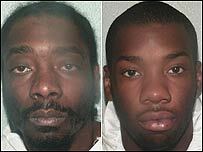 Killers Anthony Green, 35, of Loughton, Essex and Carl Dobson, 23, of Stratford, London, were given 30-year minimum terms at the Old Bailey. Mr Mahorn, 25, of Chingford, east London, was cleared of murder. The court heard Mr Mahorn, who was also cleared of manslaughter, complained the song by Mr Holmes's friend, Sabar Shah, 16, was disrespectful to him, a court heard. The song accused Mr Mahorn of having "lost touch with his roots", said Richard Horwell, QC, prosecuting. Mr Shah's lyrics said: "Over the years, things change in the hood. I used to have a lot of respect for Durrty Goodz - Not no more." Mr Horwell said Mr Shah's point was he felt Mr Mahorn had turned his back on the estate since his music career had taken off. The killing was about "revenge, false pride, misplaced loyalty"
Mr Horwell said Mr Mahorn cornered Sabar Shah, himself a budding rapper who was known as Shak, and demanded an apology. "I am a 24-year-old man," Mr Mahorn is alleged to have told him. "I can't have a 16-year-old saying things like that to me." Shak refused to apologise and later that evening Mr Holmes and some friends were surrounded by associates of Mr Mahorn armed with a Mac-10 machine gun. The Common Serjeant of London Judge Brian Barker said: "This was an operation of staggering ruthlessness and arrogance. "This was nothing but a cold-blooded killing." Det Ch Insp Matt Horne, who led the investigation, said: "The fact the catalyst for the violence was the lyrics of a song somehow makes [Richard's] death even more senseless."